Jürgen Weiner - you can’t get away with not knowing this name if you are involved in Experimental Archaeology, even more if it involves flint. Weiner has published numerous works and he is known as a walking encyclopaedia. Along with Marquardt Lund, I met Jürgen and his charming wife in their house near Cologne. Our interview took place on a pleasant June afternoon in the garden, later shifting into the kitchen; Jürgen is an excellent cook and prepared a bean stew „tavče prebranac“. We subsequently moved down into the basement, where we were captivated by his library, workspace and collection. We finally ended our conversation in the early hours of the following morning, in the living room. Jürgen´s stories are as spicy as the dinner, embellished with anecdotes, all of which I cannot render here. Moreover, he turns out to be an exceptional entertainer, time and again falling skilfully into every possible dialect and more than once matchlessly imitating certain luminaries of archaeology – we laughed a lot throughout the evening. As I always said: starting point for experiments is not wishful thinking, imagination, fantasy. Firstly, you have to start with finds and features and the hypotheses and questionings you can deduct from them and test. Secondly, you absolutely have to inform yourself, i.e. obtaining as much information as possible about each and every experiment you want to do, every publication. Perhaps somebody else worked on this subject already. You can´t collect enough information – the safer your own basis will be where you can judge from. I´ve been to eight schools in four federal states and every few years fetched up elsewhere in my parents’ hand luggage. In the 1950s I was lucky to live in the Sauerland, 100 meters off the forest´s edge, and during the summer I was more in the woods than at home. So the neighbour´s children and I always had full contact with nature, and I still remember very well: my father said then “you mustn´t do that, this is poaching” (we laugh) - so I came home with trout. I know I still can manage that. At that place creeks run through the forest, and the fish wait where the roots are washed-out. Here you lay down on the ground and grab the fish with both hands at both ends. Very careful then, and, Pow! they trash around four meters behind you. Fresh-water crayfish, those days all this was still there, and leeches of course, stuck to the legs … Alas! Anyway this was nice, and already back then I knew that I wanted to do anything professional in the open countryside, but what exactly wasn´t clear to me. Finally I went to boarding school in Bad Honnef and later to schools in Neustadt/Palatinate and Baden-Württemberg. Of course, I´ll never get invited anywhere, you know, “800 years graduation” or so, because hardly I was at any school I already had to leave again. But anyhow I accomplished my high school diploma, May 1969. After that I studied national economy for one semester in Bonn which was a mess, because I knew I wanted something totally different. Then I inquired at the University of Cologne, Pre- and Protohistory, and I drove to the institute in July ´69. The secretary went into the study of Prof. Schwabedissen, and he said: “Mrs. Bahn, please bring coffee and cookies and send in the young man”, and then I sat on the sofa. He sat in his armchair, we talked for a while, and thereafter they had a new student. After a few months private reasons forced me to quit Prehistory and instead studied law, but for the most part could be found on the tennis court, and this was a disaster once again. Then I quit university altogether and went to work at one of the leading German insurance companies – my father was an insurance salesman – and successfully sold life insurances. But at some point it became clear to me that this wasn´t the right thing either. And so I took up my prehistory studies in Cologne once again in September 1972. From the very beginning stones fascinated me, and until today I don´t know why! This was right at the start of your studies? Oh yeah, our main subject was Prehistory, and Lutz, in those days one of the very few excellent experts in Lithic Technology in Germany, recommended to me the papers by Donald Crabtree from Idaho/US. This guy published very readable articles about flintknapping already in the 1960s/70s and sent them to me for free on request! Looking back at all these ca. 230 papers I published since 1979, then it´s obvious: it all grew organically. Back then Stefan Veil and I while on our way to attend lectures at a couple of university institutes, searched for the bases of smashed beer bottles and started processing them with collected hammer-stones. And of course, having made an arrow head from flint for the first time, it itches to haft it too. But we all know, this is not taking a stick and Bingo! (we laugh). The making of an arrowhead takes just a few minutes, but the entire arrow, the fletching – this is the main work. People think, oh, such an axe blade, this takes days, weeks, but this ain´t true. Manufacturing the wooden handle takes significantly more time in any case. And once you have an arrow it´s just a matter of time until you want to build a bow. This way I got to focus on as well as acquainted with other raw materials. This extensive number of articles includes some I take for exceptionally important. And I always – especially if I think about the vast amount of old literature I collected and evaluated – consider this as a distinct service for the readership. My most recent papers deal with gunflints, and as far as I know no German archaeologist researched about this subject comprehensively, apart from a few and more regionally important articles. Well now, time and again: flint. And again it all turned out to develop organically, too. 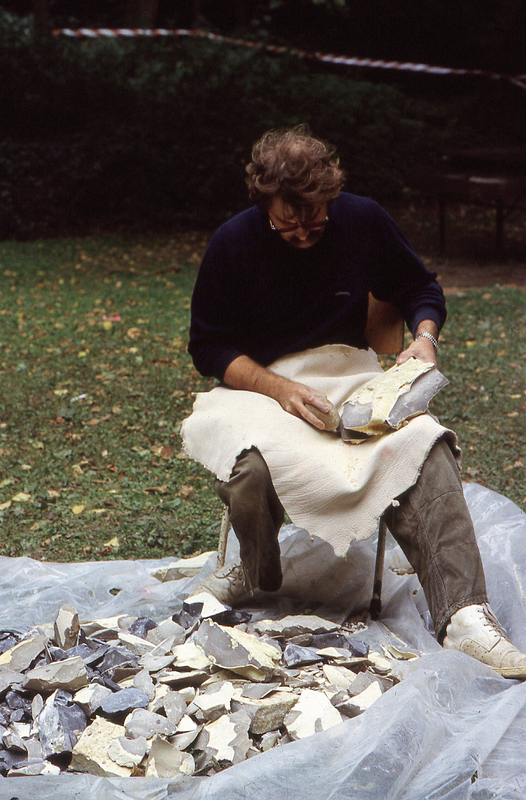 I was the first German archaeologist who was invited to the second international symposium of lithic technology in Lejre in 1981, and I´m still proud of it. In October 1980 we had invited Marc Newcomer and Bo Madsen to the opening of the exhibition “5000 years Flintmining” in the German Mining Museum (DBM) in Bochum, where they demonstrated flintknapping, and the invitation to Denmark was caused by Bo. There I acquainted Errett Callahan, Jaques Pelegrin, Debby Olausson, Thomas Johansson and Peter Kelterborn, and I met Anders Fischer, Hans de Haas, Ivan Andersen and Thorbjørn Pedersen, too. On the last day an unknown flintknapper appeared with an open backpack, inside stuck a long item wrapped in a blanket. He gave a strong pull at it, and out came a 60 cm long, entirely ground four-sided flint axe blade, which he had made – spectacular! We were asked to report about the symposium in our particular country, and I published something in the “Kunde” (German archaeology magazine); in those days, reports about events such like this were something completely new in German Prehistory research. I collected flint regularly on the island of Sylt/North Sea, at the so-called Red Cliff; we had a holiday apartment there and later a house, and in my garage here at home there is still some of that material. And then something happened – I use to call it: right time, right place! Back then I was a student in the 3rd or 4th semester and had found contact to the famous DFG (German Research Community) research project (SAP) on “Settlement Archaeology on the Aldenhovener Platte (a geographic region between Cologne and Aachen)”. One of these days the project leader, Jens Lüning, asked me whether I would like to attend the monthly working meetings at SAP’s base near the opencast mine “Zukunft-West”. At that time important excavations took place there on Neolithic, especially Bandkeramik settlement sites. During one of these meetings, I believe it was in 1975, Hartwig Löhr reckoned, the time has come to absolutely address the assumed flint mine Lousberg – an excavation there would be mandatory. And then – I´ll never forget that moment – J. Lüning looked around, and suddenly everybody was staring at me, and Lüning said: “Well, Mr. Weiner, what do you think about this?” Indeed, I never conducted an excavation before, but since taking part in H. Thieme´s dig at Rheindahlen in July/August 1973 I had some experience in excavating. Additionally, I didn´t only cook in the construction trailer in the evenings, but also learned a lot about organizing and leading an excavation, this was wonderful. So the result of the SAP meeting was: Weiner digs at the Lousberg! Due to the contact to G. Weisgerber of the DBM, Lüning was able to secure the financing of the first excavation campaign with ca. 3500 Deutschmarks. In a totally rainy May 1979 the excavation started sheltered below a roof-like construction rigged up for free by the Malteser Hilfsdienst (German aid group) during a last-minute fixed exercise! Furthermore the Malteser put up a huge tent and provided it with desks, chairs, bunk beds, hotplates and gas bottles in order to accommodate the whole crew. The results of the first campaign, presented on a press conference, were so encouraging that the attendant representative of the City of Aachen warranted us the financing of another month of digging. During the subsequent campaigns in 1979 and 1980 we were able to achieve our aims. On the third campaign in 1980 we actually found the for a long time past hoped for working face (here at the open pit mine on the Lousberg a limestone wall covered with working traces, where flint was extracted). But totally unexpected came the additional exploration of a flintknapping workshop situated close by with a central seating stone, surrounded by 340 kg of waste material and very unique tools of flint, stone, bone, and antler. During the final campaign in autumn 1980 G. Weisgerber asked me, whether I would like to participate in planning and organizing the exhibition about flint mining mentioned above. At the same time - not without ulterior motives - he begged me to lend him my – yet at that time – quite voluminous collection of pertaining literature. After consulting J. Lüning, who advised me to collaborate, I confirmed, and on April 1st 1980 I started my duties at the DBM. This was the second – let me say – coincidence: right time, right decision. On the first project meeting Weisgerber presented his concept of an exhibition dealing exceptionally with Prehistoric flint mining. Because I was meanwhile much more experienced, not only in mining but also in working of flint than the other three gentlemen present, I made a counterproposal. Steadfastly I argued that the exhibition catalogue should be planned and designed as a fundamental handbook on all aspects of the “Stone Age Steel” starting with quarrying and ending with its use during the present time. This all the more, because – as far as I knew – something like this had never been achieved in the whole world. The possibility to realize this – as we would say today – “unique selling point” for the museum was immediately recognized by the gentlemen, and consequently they accepted my proposal. It was only later that I saw how big the doors were I kicked in, they were too big to ignore them. Thus the well-known and still exemplary catalogue, published in three editions, came into being. Either is important, and everybody decides where to put his focus. I was frequently asked: how about your experiments, Jürgen, and I must say, I know about one single, real and true experiment that I initiated and carried out significantly involved. There was a questioning, even a very simple, and there was a working hypothesis, very simple, too, and this we tested, and we documented it with great effort and performed use wear analysis on the tools, this is the Ingolstadt Experiment, disassembling a fallow deer in front of the public, published in the blue volume (see above), too. By all means it is bizarre, that – due to the ‘rules of the trade’ put up by the great John Coles – carrying out experiments during public demonstrations are not deemed possible! It´s up to you to get by with this … I reckon a reasonable mixture of theory and practice is vital, but you can´t go and say, OK, hands-on, and this is it! In this light I consider two papers I wrote not unimportant, these are the two “vademecum” papers about prehistoric lithic and wood technology published in the “Archäologische Informationen”. How did you come up with the theme “birch pitch”? This traces back to Max Zurbuchen, the Swiss archaeo-technician I came to know in connection with “5000 years …” At some time in the following years I suggested him to put his experiences on paper. But because this obviously was not really his alley, I said to him: “Okay, you carry out the discussed experiment, I write something about it and we publish this together”. But this project came to nothing … So I sat down myself in my garden, produced in fact pitch of different qualities in an adventurous way using an aluminium champagne cooler and published that paper in the “Archäologisches Korrespondenzblatt”. In those days people laughed at me – because of the champagne cooler. I rate these critics to be almost certainly people who – from case to case perhaps until today – appeared or even still appear unsuspicious of deeper insights into the matter. Factually, it is likely ignored that this subject wantonly neglected by archaeology was really pushed by my paper and still is acute until today. Exactly. 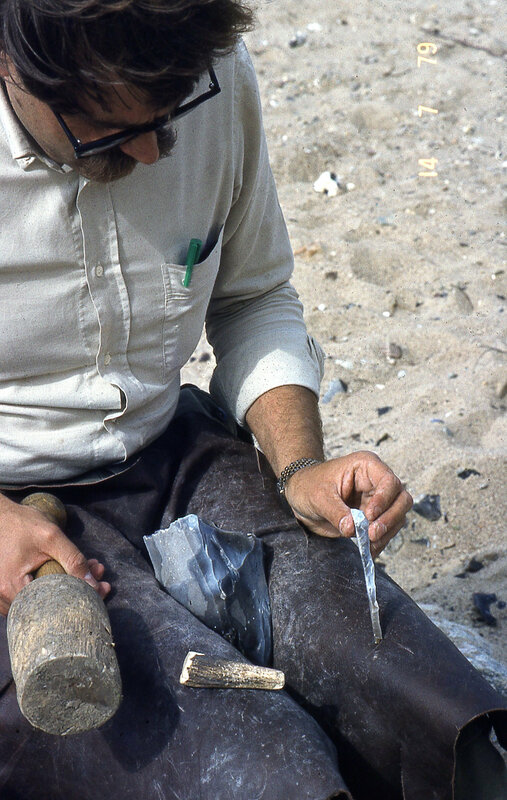 In spite of all contrary statements – I totally do not understand the untenable assessment made by Friedrich Seeberger, whom I, however, appreciate very much: “Birch pitch was made by the double pot method from the Neolithic until the modern era” (Seeberger 2002: 36) – there is still not a single evidence of a Stone Age retort. Most recently I stumbled upon a – in my opinion – sensational find from Hungary, a vessel with a hole in the centre of its bottom and explicit birch pitch incrustations; of course not Neolithic, too, but dating to the Early Bronze Age. As far as I know this is the oldest evidence for the double pot method at the moment. It is still my unshakeable belief that from Palaeolithic to Neolithic times people were capable to produce birch pitch in any desired quantity and quality, indeed without any ceramics – we just still don´t know how! That is why my provocative question, put during a lecture in the open air museum Düppel in June 1990, still is under discussion. … finally, thanks, Wulf. The discovery of “my” Bandkeramik well (Erkelenz-Kückhoven), another example of those coincidences mentioned afore … Admittedly coincidences can´t be planned, but what argues against a structured interpretation of finds like these? For me, it is – not unexpected – definitely no wonder all along that this was reason for a veritable change of paradigms. Of course I´m proud of having pushed this change. But for me the topic “water” is nowhere near terminated. Yes, from a fiscal point of view, as a tax consultant told me once … The first advertisement of “Frarney – Stone Age utensils” showed up in “Archäologie in Deutschland” (German archaeology magazine) issue 2/1988, last in issue 1/1998. Ten years company of my own! Of course with permission for spare-time work from my employer and income properly taxed. Did you ever think of doing “Frarney” full-time? No, most certainly not! I did this alongside, never for money. I always thought: No, you´ve got a regular job and that´s it. I met a lot of interesting people, and here and there we were ‘able to buy an extra pizza’, but … exclusively running my own company – no. Do you actually do experiments in the proper sense today? I have one thing on birch pitch in my mind I would like to do. But I won´t reveal this … I did something about gunflints being used as fire-flints and the use-wear, I have documented this quite well, but I still have to put that on paper. And I´d very much like to do something on ‘oversized’ adze-blades. Previously experimenters used original artefacts with their attempts, this would be impossible today. What about you in Ergersheim making some really big tools, as there are some in the archaeological record, and there you go! What would you recommend people who are thinking about carrying out archaeological experiments nowadays? But, we are not at the end of Experimental Archaeology. On my conscience plenty still remains to be done! Jürgen, how to go on now that you´re retired? If people ask me how I get along with retirement now, I quote the famous and – in my view – blessed voyager, archaeologist and member of the SIS (Secret Intelligence Service) in WW1, Gertrude Margaret Lowthian Bell (1868-1926) as saying: “Idleness leads to rumination, and this is unpleasant”. She´s right! I can only say: Nothing is too hard to fight Boredom! Heartfelt thanks for this wonderful evening!